Call RB Plumbing for commercial plumbing needs on any kind of renovation, code violation, or plumbing emergency your business may experience. Commercial service is a big part of our plumbing business. When you have a commercial plumbing emergency affecting your business or property, we know it is essential to get there fast and solve the problem in a prompt, efficient manner so you can get your business back on track. We have provided friendly service to commercial customers for over 12 years. Our equipment, manpower, and expertise are the tools we use to get your commercial plumbing problems remedied with the least interruption to you and your customers day. We guarantee all our work and offer honest, up front pricing on all commercial plumbing jobs. In many commercial applications, crawl spaces are involved. In this case, our plumbers are prepared to get under your building to locate and fix the problem at its source. Crawl space plumbing can be a particular problem because, as the building ages and settles above the crawl space, there may be changes to the structure, some more noticeable than others. Unfortunately, this can cause plumbing issues, such as plumbing leaks and disconnects. If you think something has gone wrong with plumbing or gas lines because of building shifts, give RB Plumbing a call to get an estimate on repairs. In order to comply with occupancy codes, most commercial buildings are required to install handicap plumbing equipment. At RB Plumbing, we know how to install all manner of handicap plumbing fixtures, so your building is handicap friendly. Some of the devices we install and repair include comfort height toilets, easy-turn faucets, grab bars, hand held showers, and handicap showers. If you need to add handicap plumbing to your commercial building, please give us a call! 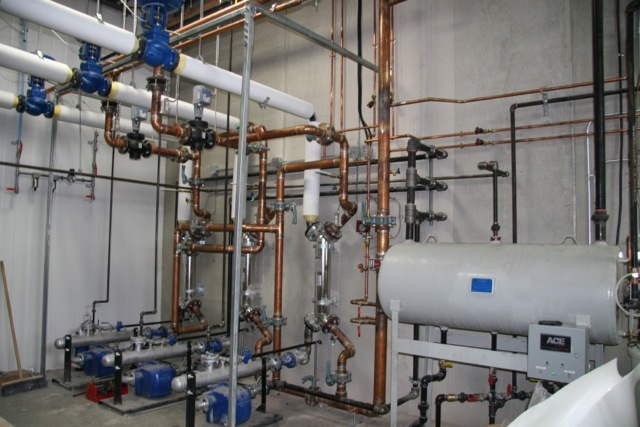 If you are thinking about updating your commercial building's pipes and drains, consider copper piping, always recommended for potable water. Copper piping is the most durable pipe material and is generally guaranteed from the manufacturer for fifty years. When combining that with our work guarantee, you can install copper piping and likely never have to worry about your pipes again. Copper piping does not corrode and can add value to your building when selling it. Call RB Plumbing for an estimate on copper piping today. At RB Plumbing, our plumbing services are extensive, and we can't list them all. If you have any questions about what we can do for your commercial plumbing application, please call us for more information. If we are unable to help you, we know someone who can and will give you a recommendation because we know you will come back to us. We are the most trusted, honest, local plumbers and want to help in any way we can.